A fine 11.5 mile circular walk from Ingleton to Chapel-le-Dale along White Scars before returning above the other side of the valley on Twistleton Scars. For a long time now I’ve thought that a horseshoe walk above the valley of Chapel-le-Dale exploring the steep limestone scars that flank both sides of the dale would make for a particularly fine expedition. I’d added it to my ‘to-do’ list for this year and was one of the walks that I’d planned to save for a particularly nice day. My opportunity came, or so I thought, on one of those days when there is plenty of blue sky and scattered cotton wool clouds. It looked perfect outside so instead, of the evening walk I’d planned, I booked an early finish at work and set off for Ingleton. Unfortunately, in terms of blue sky I was going to be disappointed. As I drove along the A59 and A65 I could see a huge bank of high cloud approaching from the south. My hopes that it would pass to the east of where I was going were dashed and before I’d even set foot on White Scars the cloud had rolled over. On a more positive note, whilst the weather was not what I’d hoped for, the walk itself was still a cracker. Starting from the pay and display car park in Ingleton I walked east out of the car park to reach the B6255 road to Hawes. Turning left on this I climbed uphill round a couple of bends to reach the foot of the stony Fell Lane. This is the start of the popular route on to Ingleborough via Crina Bottom and was also my route on to White Scars. At this stage there was still a bit of sunshine and as I marched up the track I kept looking anxiously to my right as the cloud spread over the sky. After a mile and a quarter the enclosed track passes a gate on to open fellside next to two benches. Here I left the track to follow the wall uphill on my left. A faint path along the wall made the going easy. Just across the brow, and before the wall started to drop downhill again, I turned right to begin the largely pathless wander across the limestone ridges and pavements of White Scars. I’d picked a good time of year to visit White Scars due to the profusion of springtime flowers dotted about. During the course of my traverse of the limestone plateau I came across early purple orchids, tormentil, cuckooflower and violets. I was also surprised and delighted to find clusters of bluebells growing in some of the more sheltered pavements, not a flower I was expecting to see at over 400m above sea level. After making a beeline for two cairns on one of the highest points of the plateau I made my way towards the top end of a broken wall. Along the way I passed several examples of erratic boulders, old rocks deposited on tops of the limestone pavement. Making my way down to a striking cairn above Raven Scars I enjoyed some fantastic views down into Chapel-le-Dale and across to Twistleton Scars. The cairn itself was superbly constructed and must have been almost 12ft high. From the cairn I followed a path of sorts sticking closer to the edge of the plateau. At the point where this curves around Spice Gill Hole I encountered a wall, the only real obstacle on the whole route. While there may well have been a stile or gate higher up the wall I came across a large boulder handily placed right next to the wall. This made it easy to cross the wall safely without doing any damage. Having crossed the wall I was now on Southerscales Scars which is part of the Yorkshire Wildlife Trust’s Southerscales Nature Reserve. Here there was another superb section of limestone pavement, this time dotted with trees. Shortly afterwards I gained the path from Chapel-le-Dale to Ingleborough. Without following this all the way to the Old Hill Inn I branched off on sloping grassy path that zig-zagged down to Souther Scales. Passing the rather ominous house, which is next to a substantial ruin, I dropped down through some slightly wooded pastures where there was a superb display of primroses. Crossing over the road I then took the minor road, which was fringed with wild garlic, leading to St Leonard’s Church. Following the road up past the church I passed the dark hole of Hurtle Pot to continue up towards the house at Gill Head. Along the way I passed the sculpture by Charles I’Anson simply called ‘The Statue’. According to the plaque below it had to be rescused in 1983 after vandals through it down Hurtle Pot! Shortly afterwards the track entered access land, here I turned left to follow a faint path heading south-west on High Scales Rigg. This eventually merged with a wider grassy track which I continued following above Twistleton Scar. At times the path got quite close to the edge amnd provided more superb views down into Chapel-le-Dale and of the extensive limestone scars I was walking above. 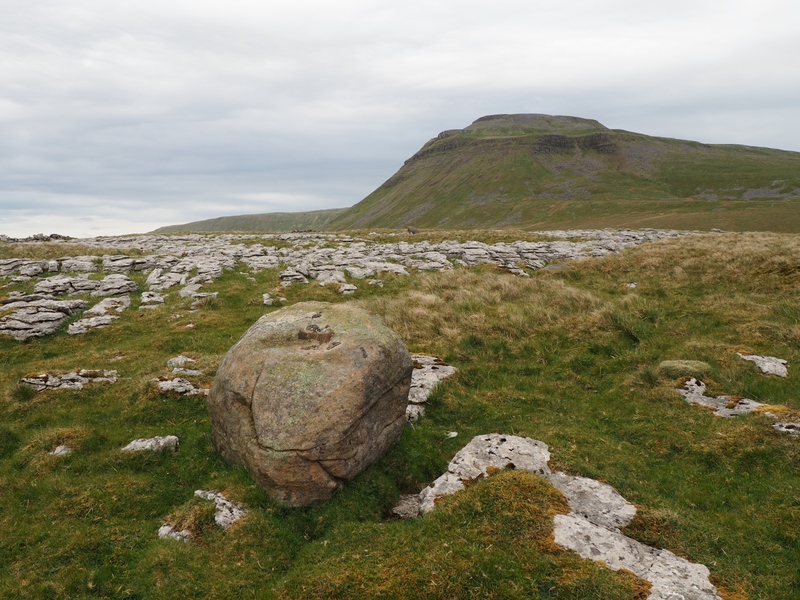 As with the majority of the walk the views were dominated by Ingleborough, now standing high above White Scars that I’d traversed earlier in the walk. Eventually the path curved around the far side of the cairn on Ewes Top to meet the public right of way that drops down Twistleton Scar End. The zig-zag path down the latter was made all the more pretty by the large numbers of tormentil either side of the path. At the foot of Twistleton Scar End I turned left on a path which will be familiar to walkers who have done Ingleton Waterfall Walk. Having not paid my dues and with time getting on I didn’t follow the path as far down as Beezely Falls. Instead, upon reaching Oddie’s Lane I turned right for a 1.5 mile walk back into Ingleton along the quiet lane. Disappointing as the lack of sunshine was this was a superb walk and one I’ll definitely do again. There are a couple of caveats. Care obviously needs to be taken on the clints and grikes (some of which were at least a couple of feet deep). Secondly, due to the lack of clear paths, good visibility is a must. Otherwise the walk is huge fun which largely escapes the crowds on Ingleborough and around the Ingleton waterfalls.